You've lost a lot of weight but chances are, you didn't lose it in all the right places. Women and men who have had weight loss surgery in San Ramon, CA choose liposuction to slim their body contour and remove leftover pockets of fat. Most gastric bypass patients have a significant amount of loose skin, and liposuction in San Ramon or Tracy won't provide skin tightening by itself. In fact, removing fat tissue can create additional loose skin. This is why Dr. McNemar often performs liposuction in conjunction with procedures such as tummy tuck, thigh lift, and body lift. The best way to find out if you can benefit from liposuction? Talk with Dr. McNemar - he'll be happy to help. Request a private consultation where he will share your options with you and give you his honest, professional opinion on how plastic surgery can help you reach your ultimate weight loss and cosmetic goals. You had many goals in mind when you chose weight loss surgery in San Francisco or San Ramon - goals like improving your health and energy, reducing your risk of certain illnesses, and enhancing your self image. Have you made all these commitments and sacrifices just to achieve a body that looks so-so? You deserve better. Dr. McNemar's cosmetic surgery options, including liposuction, can help you look your very best. Liposuction is a proven method to safely and permanently remove localized fat deposits. Dr. McNemar has performed hundreds of liposuction procedures using some of the latest techniques and technologies to achieve remarkable results and to shorten recovery time. This procedure can be used to contour almost any area of your body where excess fat lingers, including the stomach, hips, and thighs. During surgery, a medical device known as a cannula is inserted into areas of fat tissue. The cannula is used to break up and remove these pockets of fat. Dr. McNemar's techniques minimize the damage to surrounding healthy tissue to help speed your recovery. Dr. McNemar also makes an effort to minimize scars, and if you are having other body contouring procedures such as a tummy tuck or thigh lift, liposuction in many cases will not require any additional incisions. Keep in mind that liposuction is not meant to help you reach your weight loss goals. Dr. McNemar is only able to safely remove a certain amount of fat during the liposuction procedures he performs. 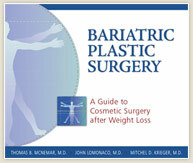 Before your surgery, you should be at or near your ideal weight and focused solely on body contouring. You've lost the weight and now it's time to enhance your body contour. Liposuction is a popular procedure among Dr. McNemar's weight loss surgery patients from San Ramon, Walnut Creek, Modesto, and beyond. This procedure picks up where diet and exercise fall a little short, helping women and men create a smooth and shapely contour that enhances their confidence. Dr. McNemar has seen the transformations firsthand, and he looks forward to helping you complete your transformation.